When most of you see this post I'll be getting ready to head over to the Convention Center to CHA! I'm so excited!!! My camera battery is charged and I have a spare! July 31 - ssnotime98 - Lovely Lace - I have always loved lace -- nothing is so pretty and delicate and it adds such a charming touch to a card. Today's challenge is to incorporate lace into your work. It can be real lace, punched lace, stamped lace, sticker lace -- anything at all - as long as we have lace to grace our creation! That's it - have fun!!! I've used eyelet lace on this card--the kind you thread ribbon through. I've always loved that stuff. My image is a fairly new Karen Lockhart stamp called English Daisies and was stamped on Pure Luxury 80lb paper by Gina K. with Memento Rich Cocoa ink and colored with Copic markers. My patterned paper is the Abbey Road series by Bo Bunny and my card stock is the new In Color Bermuda Bay and PTI's New Leaf. I made my bow with my Bow Easy. I can tie pretty bows, but this thing makes it FAIL SAFE, LOL! Lots of layers and elements--which I love--and texture make this a card I'm happy with. The sentiment is from PTI's Mixed Messages set, stamped on Whisper White with Memento Rich Cocoa and cut/embossed with a Spellbinders tag die and tied on with a button and Perle cotton. My layout is this week's My Favorite Things' sketch challenge. Check it out here, and while you're at it, check out the newest My Favorite Challenge in the same thread. We have a new one of each every Thursday on the forum and use that thread for chatting throughout the week. This is the first time for me to use this set by Stephnie Fizer called Snuggle Bunnies. I just love how sweet those two little bunnies look snuggled up together! I think I'll use this one as an anniversary card ;-) The image was stamped on a Perfect Paper Panel with Memento Tuxedo Black ink and colored with Copic markers, then cut out. Oh, and I used Liquid Applique on the bunnies tails. The patterned paper I'm using is Periphery by Basic Grey--I think it's OK for an anniversary card--this would be great paper to use for a masculine card, too! Other than the Whisper White card base, there's no other card stock used on this card--it's all patterned paper. Again, I think the mechanics of this card are self-explanatory. AND! As you read this I'm on my way to CHA!! Hey that rhymes, LOL! Woohoo! Can't wait to meet all the MFT girls that are going to be there, and my CTD pal, Broni! And many other people that I don't know yet! And see all the new stuff!!! I'll try to post some pictures while I'm gone, but if not, I'll be sure to share lots when I get back! Do you want to be an MFT VIP? Of COURSE you do! Being a VIP comes with perks! Your VIP bundle will include NEW products that have not been released yet. Excited yet? The bundle will be shipped out quickly so you'll probably have your stamp set before the release date. You can post teasers along with the design team and even post your card samples during the release party if you would like to. There are a limited number of bundles available and they are available for only ONE DAY! Show your MFT spirit and be a VIP! The VIP is available for ONE DAY ONLY! Buy it today (July 29th) ONLY. Trick or Treat with Who's That Girl? The bundle retails for $43.85. You can find it HERE. VIP perk #2: Should you wish to purchase the One-Click Collection within the first 48 hours of the release on August 5th, you may switch out your VIP WTG? set with any other set on the site by mentioning your selection in the comments section of that order. VIP perk #3: You will receive a code good for $5 off your next order! The Spooky Ribbon Nest includes 3 yards each of 5 fabulously spooky ribbons for a total of 15 yards! The ribbons included are: 5/8" Green Apple Velvet, 1/8" Purple Potion Satin Dot, 1/8" Tangerine Satin Dot, 3/8" White with Black Stitch, 1" Black with White Stitch. Coming to CHA? We will have a limited number of MFT VIP kits available for sale at the show! Come by early and grab it while you can! Be one of the FIRST to own this adorable new set and coordinating ribbon/crystals! Each month, a new Kit will be revealed, complete with an *exclusive*, unreleased stamp set, and the items you'll need to complete a very special project (s). Our July kit will only be available for 2 more weeks (or until they sell out)! The kit sold out quickly after it was released, but is now back in stock in limited quantities. Grab it while you can! Coming to CHA? We will have a limited number of kits on hand! The kit retails for only $25 and is available NOW! The set included with your MFT Kit is a brand new, unreleased set, and will not be available for a period of at least 3 months after the MFT Kit containing the set is released. The August edition of the MFT Kit will be available on August 12th at midnight EST. Have you seen Smooch paints? Have you wondered WHAT they were and how to use them? This week, Jessie teaches you all about Smooches! Head over to our HTDT forum where you'll find this tutorial (and MANY others). Smooch - Pucker up for a perfect kiss of color! Clearsnap Smooch Pearlized Accent Ink is a pigmented pearlized paint that is great for enhancing your paper projects. 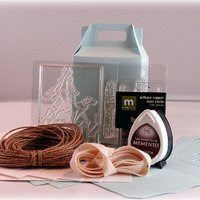 It can also be used on fabric, wood, acrylics, cardstock, clay, glass and much more. Each bottle has approximately .33 ounce and is acid free, archival and fast drying. There are MANY colors to choose from and they retail for only $4.50 each! 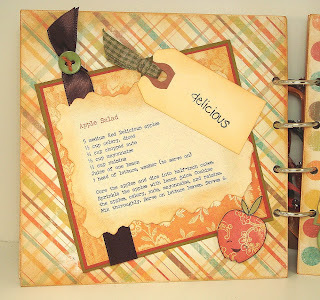 Check out the tutorial and then go add some Smooches to your cart! Happy Wednesday! You know what that means--another Color Throwdown Challenge!! Today's colors come to compliments of Danielle: Bordering Blue, Pink Pirouette, and Rose Red. This combination was a REAL challenge for me! It took me hours to decide what to do, thinking, looking through all my patterned paper to find something to pull these colors together. Finally, I found the only thing in my stash that would remotely work--a Cotton Scraps image by Crafty Secrets! I decided to use the Bordering Blue as my neutral and I think it worked OK. I cut the image out with my dressmaker's pinking sheers, stitched around it to keep it from fraying too much, and then distressed it a bit with Ranger Distress Ink in Tea Dye. The rest of the card construction is pretty straight-forward, I think. I used my Bow Easy for my bow again and pinned on the little sentiment tag with a Tim Holtz mini safety pin--I love those little pins and paper clips!! So tiny and CUTE!! A few buttons for balance and that's about it! So, why don't you c'mon over to the Color Throwdown blog and play along with us this week. Please use Mr. Linky to post your card and please link directly to your card so we can find it easily. If you upload your card to a public forum, please use the keyword CTD53 so we can see your beauty all in one place. Hope to see you there! And don't forget--you may be chosen to be our Featured Stamper so get your card in the running! I think this is the very first time I've done the Weekend Sketch Challenge. Just never has been enough time, but this sweet little sketch really got my attention and I made time to do it. This week's challenge was hosted by Laurie Schmidlin. 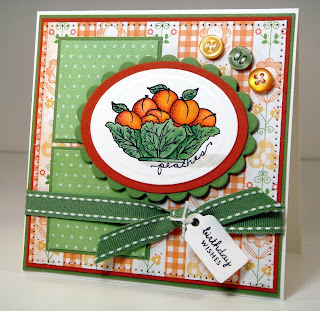 The focal image is a Karen Lockhart stamp called, well, Peaches, LOL. Peaches will be coming in here soon so I thought it was time to get this one out and dusted off. What a cute image this is--as are all Lockhart stamps. It was stamped with Memento Tuxedo Black ink on Pure Luxury 80 lb paper by Gina K, and colored with Copic markers. Then cut/embossed with a classic oval Nestabilities die, matted, and popped up on 3M foam squares. My patterned paper is from the Nana's Kitchen mat stack by DCWV and my card stock is Wild Wasabi and Really Rust, along with a Whisper White base. The sentiment is from PTI's Mixed Messages set, stamped with Tuxedo Black on Whisper White, cut out with a Spellbinder's tag die, and tied on with Perle cotton. Some ribbon and some buttons and that's that! I'm so glad you dropped in today! Be sure to come back tomorrow for the Color Throwdown Challenge! Good morning! 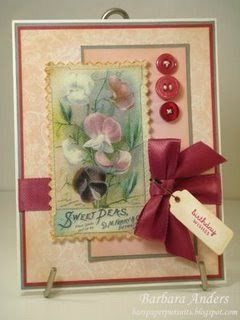 Today I have a card using the Taylored Expressions sketch for this week--#75. Seems like lots of sketches lately are using "threes" and that's OK with me--I'm loving how they look. 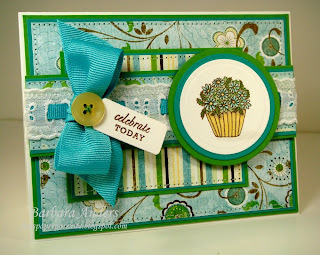 For this card I'm using one of Flourishes' newest releases called Seaside Life. I chose three of the smallest images, stamped them on River Rock with Versamark and heat embossed with white detail embossing powder. Love that white on River Rock. My patterned paper is from the Wisteria 6 x 6 pad by Basic Grey and my cardstock is Whisper White and River Rock. Ribbon is River Rock double stitched and I've added some half pearls for accent. Hope you like it! Can you believe it?! SCS challenges two days in a row!! Yippee!!! Today I have the latest color combination--228--to show you. I would never have put these colors together but they work and I love 'em: Night Of Navy, Really Rust, and Pink Pirouette! Genius!! My image is a PSX stamp, the name of which I'm assuming is Time Began In a Garden! It's stamped on Gina K. Pure Luxury 80lb paper with Memento Tuxedo Black ink and colored with Copic markers. I love the way this colored up! It's another fairly large image so I went with a 5 1/4" square base. The patterned paper I'm using is from the new June Bug 6 x 6 pad by Basic Grey and my card stock is all of the challenge colors. My layout is pretty simple. The middle element has punched borders and I added a little paper piercing to give it a little interest. Little ribbon tabs and buttons add a little somethin' more. I'm so glad you dropped by today!!! Well, it's been a long time since I've done a SCS challenge but I got the chance to do the sketch for this week!! This is Sketch Challenge #238 and I love it! Had to do it! This card is about as CAS as I get, LOL! 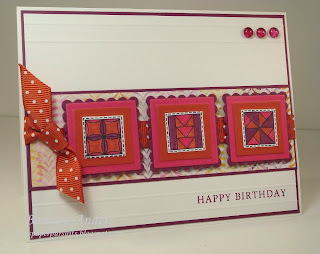 I decided I wanted to use a few of my new In Colors, and PTI's quilt squares lend themselves to this kind of sketch so well so I paired them for this card. I'm using the new DSP called Razzleberry Lemonade and Rich Razzleberry, Melon Mambo, and Dusty Durango card stock. I like the new In Colors--especially Rich Razzleberry--but I still miss Kiwi Kiss and Baja Breeze! Glad I stocked up on them! I think the mechanics of this card are pretty self-explanatory. The quilt blocks were stamped on Whisper White with Memento Tuxedo Black ink and colored with the NEW In Color Stampin' Write markers! I'm SOOOOOOOOO glad they finally did that!!!! Then matted with the three card stock colors and popped up on 3M foam squares. The ribbon is the new polka dotted ribbon in Dusty Durango. I made a couple score marks at the top and bottom and stamped the sentiment and added some Dew Drops between the lines. Pretty simple, actually, but I really like how it turned out! I'm so glad you dropped in today! July 24 - ssnotime97 - Fruit of the Vine - Fruit, the perfect summer snack, or even meal! I love it! 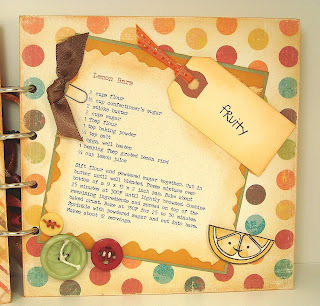 Today let us whip up some fruity type of creation during this time of year when fruit is so plentiful everywhere. 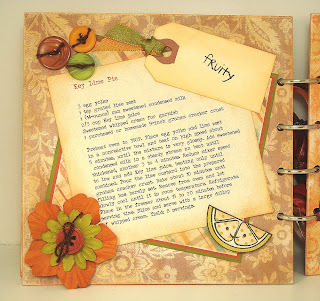 I'm sure most everyone has some fruit stamps, or images, and if you don't, how about trying to create some fruit with punches? 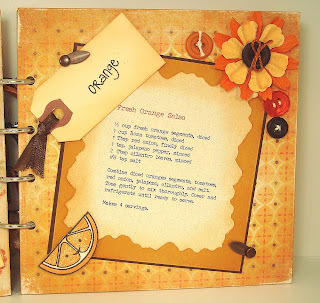 Or, if you really need to stretch it, how about some *orange* ribbon, watermelon paper, etc. I think you get the idea -- just get fruity and have a little fun! So, here's my "fruity" card. I've had this fabulous Flourishes' lemon set for a while and it's never seen ink! So thanks for the challenge, Sharon--it got me to use it. 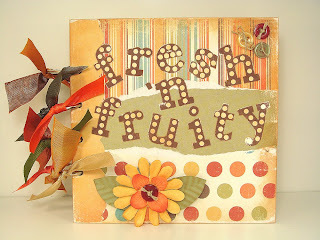 I'm also using this card for Flourishes' Timeless Tuesday challenge for this week--to use Shimmerz. I think you can see the shimmer on the upper leaf--I put it all over the image but the rest isn't showing up in this picture. The patterned paper I'm using is from the Citronella mat pad by K & C0. (note to self: I love it, get more!). The only card stock I'm using is Whisper White for the base and the Yoyo Yellow layer on the bottom element. The image was stamped on Pure Luxury 80lb paper by Gina K. with Memento Tuxedo Black ink and colored with Copic markers. Then it was cut/embossed with a Nestabilities Oval die. Next I applied some Angel Wings Shimmerz and matted it with patterned paper, also cut/embossed with oval dies. A rusty orange ribbon was tied around in a bow and I called it done! I think I met the "fruit" challenge, don't you? ;-) You think I might have gone a little overboard, LOL? I still love I Need Coffee Flopsey so much!!!! Apparently I'm not the only one--he seems to be sold out! Do check back often--he'll be back! I ran across this paper at Archivers and of course I had to have it--it's perfect with him! Flopsey is stamped on Perfect Paper Panels with Memento Rich Cocoa ink and colored with Copic markers, then cut out and popped up on 3M foam squares. My patterned paper is called Coffee Talk and it's by Flair Designs. Card stock is Chocolate Chip and Creamy Caramel. I think everything is pretty self expanatory. Flopsey's background element was cut/embossed with Oval Nestabilities dies and the Creamy Caramel run through my Cuttlebug with the D'vine Swirls embossing folder--to match the swirls of steam from his coffee cup :) I used a corner rounder on the two outside corners and a border punch on the horizontal element. A few cafe' au lait colored brads complete the look, don't you think? Check out all that's going on at My Favorite Things today! 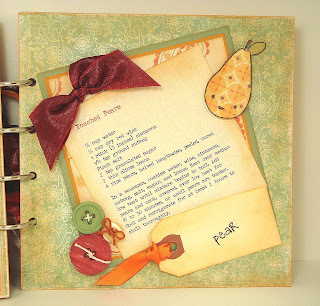 This week, Amy will be showing you how to beautifully photograph your papercrafting projects! You'll learn how to set up your shot, take the photograph and even edit your photo to present your projects for your blog and/or online galleries. Are you ready to Learn. Grow. Know. with MFT? Come on over to the MFT HTDT? forum to check out the tutorial HERE. If you are one of the FIRST 50 customers to order today, we'll give you a FREE Memento Dew Drop for your collection. Week 4: Canteloupe! You don't need to do a thing to receive your bonus, if you are one of the first 50 orders, you automatically qualify! The First 50 does not apply if your order is for digital paper, and requires no shipping. This week, we are offering TWO hook-ups! The first is a 10% savings on all products in the "My Favorite Products" category from 7/22-7/28. This includes MFT's stamp cleaner (a MUST have) and scrubber, Perfect Paper Panels, Clear Stamp Storage Boxes, Eclipse Masking Panels, Glue Glider Pro and refills, Diamond Glaze, White Shimmer Flowers and Scor- Tape products! The second is a one day only sale! TODAY ONLY, MFT is offering any 5 stamp sets for $50! Simply add the "5 for $50" product to your cart and then write in the comments section the 5 sets you would like. Please include at least 2 alternate sets in the event that your choices are out of stock. This promotion is good ONLY on in-stock merchanidise. Mornin'! It's another Color Throwdown Challenge and another sponsor week! 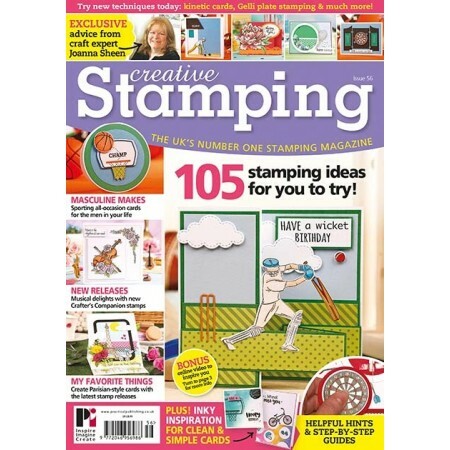 This week our sponsor is Clear and Simple Stamps. You can read all about the company on the Throwdown Blog. AND, today it's my turn to be the hostess. The colors I chose for this week are: Perfect Plum, Certainly Celery, and Chocolate Chip. The Clear and Simple stamp set I'm using is called Tea Time and it's a sweet, sweet set! I love that little tea pot and cup/saucer, and the sentiments are perfect! I stamped the images on patterned paper with Memento Rich Cocoa ink, paper pieced the tea pot and cup and saucer and added a little Copic marker in warm neutrals for some shading. Then I cut them out and popped them up on some Nestabilities cut/embossed circles. 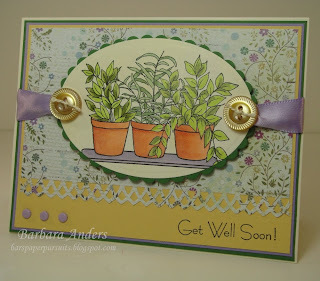 The sentiment was stamped in the same way and cut/embossed with a Spellbinders tag die. For embellishements I added some ribbon, Prima flowers, and a button from my stash. I tied the sentiment tag and button on with Perle cotton. Now, c'mon over to the Color Throwdown blog and play along with us this week. Please use Mr. Linky to post your card and please link directly to your card so we can find it easily. If you upload your card to a public forum, please use the keyword CTD52 so we can see your beauty all in one place. Hope to see you there! And don't forget--this week there's a chance to win some free stamps, and we'll be picking a featured stamper too!!! 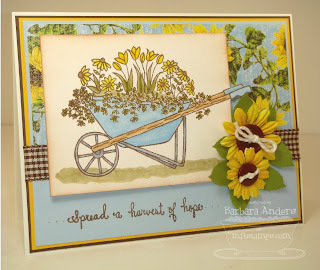 Here's another card using one of My Favorite Things' latest releases, Spread a Harvest of Hope. I stamped the image on Perfect Paper Panels with Memento Rich Cocoa ink and colored it with Copic markers, cut the handles "out of the box", sponged around the edges with Creamy Caramel ink, and popped up on 3M foam squares. My patterned paper is by Bo Bunny and is called Shabby Princess Sunflower. Card stock is Chocolate Chip, Summer Sun, and Bashful Blue. Some brown gingham ribbon, some Prima flowers, and some buttons finish it off. Celebrate MFT Day and somethin' new! Every month on the 20th is Celebrate MFT day. 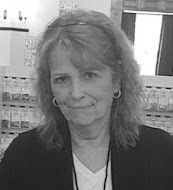 The somethin' new is a customer blog hop! You can find out all about it here, but basically, we're going to be showcasing some of My Favorite Things' customers on this day every month. So, be sure and check out the gallery at SCS and get your entries in. Future blog hop participants will be chosen from participants, so get those cards in the gallery! Here's my card for Celebrate MFT Day. 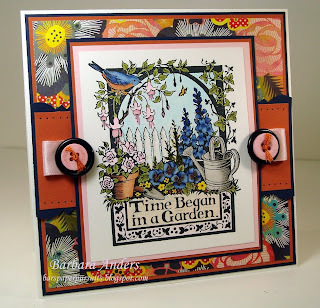 I'm using the stamp from the first MFT kit that's available all month called On the Pier. The image was stamped on Perfect Paper Panels with Memento Rich Cocoa ink and colored with Copic markers. I did a lot of distressing on this card, both with Ranger Old Photograph distress ink and a sanding block. The sentiment was stamped on Very Vanilla with Really Rust ink, punched out and layered on Blue Bayou cut/embossed with a Reverse Circle Nestabilities die. I like the weathered look of the distressed stitching along with that weathered wood paper. Some antique copper brads and sailor's knots in place of ribbon add the right accents, don't you think? Also, be sure to check out the Bubble Bin today--some great sets at fantastic prices! Here's another project that I did a while back but haven't posted here yet. A very good friend loves hibiscus so I made this set for her birthday present. It's done with the Kitchen Sink hibiscus set. I finally got enough good images for a set of four Thank You note cards--it took me several tries. I did the pink one you see, an orange one, a yellow one, and a lavender one--each on different patterned paper (all basic Grey), all using Old Olive as the anchor color, and all just like the one you see here. The sentiment is from PTI's Mega Mixed Messages. Today I have a get well card I made a while back for a very special person and never got it posted here. The images are from a set called Nurse Feelgood by Gina K., stamped on Pure Luxury 80 lb paper, also by Gina K. and colored with Copic markers. The images were then cut out and popped upon 3M foam squares on elements of Kraft matted with Night Of Navy. Patterned paper is from the Boxer 6 x 6 pad by Basic Grey. A few Dew Drops for accent finish it off. I love this sentiment--Get Well! Or else, LOL! July 17 - ssnotime96 - Little Black Dress - The staple of every woman's wardrobe -- or so they say. How many of you actually HAVE a little black dress? Not me! Anyway, today's challenge is to make a project of understated elegance using black and white. If you need to add in a little pop of another color, that's fine, as long as the project is primarily black and white and it's overall feel is that of understated elegance. I think this one will produce some real beauties! Can't wait to see!! And here's my card. Definitely understated (for me, LOL!) and definitely stamped simply--you'll have to decide whether or not it's elegant :) Unfortunately, I had to use my last sympathy card so I took advantage of the colors to add one to my stash. The images (the focal image is actually the semtiment image stamped inside the border image) are from Flourishes' set called Thinking Of You and were stamped on Whisper White with Versafine Onyx Black ink. Then cut/embossed with an Oval Nestabilities die and matted with another using Basic Black. My patterned paper is from the Black Tie 6 x 6 pad by Memory Box. The horizontal element is layered on Basic Black with it's border punched and with a sheer black ribbon tied around. The bow was made with my Bow Easy--perfect bows every time! 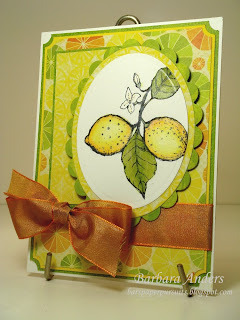 This card is for the newest sketch challenge over at the My Favorite Things forum on Splitcoast. Every Thursday we get a new sketch and a new My Favorite Challenge posted on a new thread where we also chat during the next week. Come on over and join in the fun! This image is from the Here's the Scoop set and was stamped on a Perfect Paper Panel with Memento Tuxedo Black ink and colored with Copic markers. I added some Christmas Red Stickles to the cherry for some bling :) The patterned paper is from the new Lemonade 6 x 6 pad by Basic Grey and my card stock is Pretty In Pink, Soft Sky, and Kiwi Kiss, and I stitched around the patterned paper. Following the sketch I added some ribbon and the sentiment and used some Dew Drops for accent. I'm so glad you stopped by today--hope you'll play along with us this week! Good morning! It's Color Throwdown day and have we got some new excitement for you! 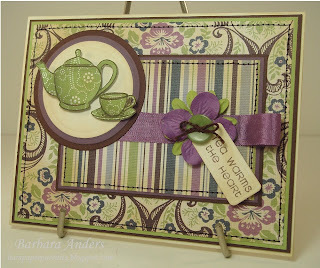 First of all, Cathy is the hostess this week and chose Lavender Lace, Garden Green, and So Saffron. Lovely colors together! AND, this week marks the beginning of a new program--sponsors!! Our first ever sponsor is DRS Designs! Check out the Throwdown blog for information about the company. They generously sent the design team stamps to use and this is the card I made with the stamps they sent me. The plant shelf image is #K097 Plant Shelf and can be found here. And the sentiment is #B254 One Line Get Well Soon and can be found here. I can tell you these are high quality stamps--rubber that is DEEPLY etched, producing a perfect image. I've loved this potted plant shelf image ever since the first time I saw it used and was so glad to get my hands on it! I stamped it on Gina K. Pure Luxury 80 lb paper with Memento Tuxedo Black ink and colored it with Copic markers. I used my brand new airbrush system to lightly color the background a pale yellow red to reduce the starkness of the white. Then it was cut/embossed with a Petite Oval Nestabilities die and matted with a scalloped oval in Garden Green. My patterned paper is from the 6 x 6 Poppyfinch pack by Memory Box and was border punched with a Martha Stewart punch. Lavender ribbon and some buttons from my stash along with some lavender brads complete the picture! C'mon over to the Color Throwdown blog and play along with us this week. Please use Mr. Linky to post your card and please link directly to your card so we can find it easily. If you upload your card to a public forum, please use the keyword CTD51 so we can see your beauty all in one place. Hope to see you there! And don't forget--this week there's a chance to win some free rubbah!!! 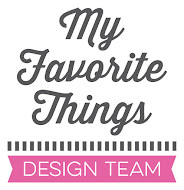 My Favorite Things Blog Hop!!! First 50: Memento Dew Drop Collection! The first 50 prize will be a Memento Dew Drop and each week, we will feature a NEW color. If you place an order each Wednesday and are in the first 50 orders, you will that week's Dew Drop for FREE. This week, the first 50 will receive a FREE Memento Dew Drop in Bamboo Leaves with their order. We are pleased and proud to introduce something fresh, fun and completely distinctive – MFT Kits! complete a very special project (s). 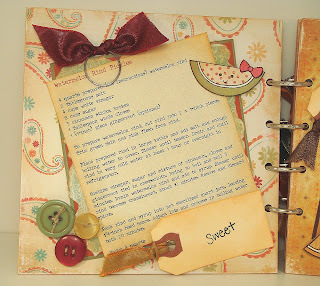 Check out this fabulous project with this month's kit in Michele's Weekly Spotlight post. This set coordinates perfectly with By the Seashore, so you have a lot of design possibilities! 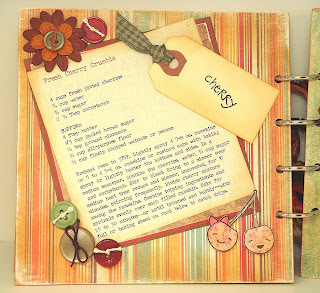 For even more inspiration, check out Kathy's How'd They Do That? 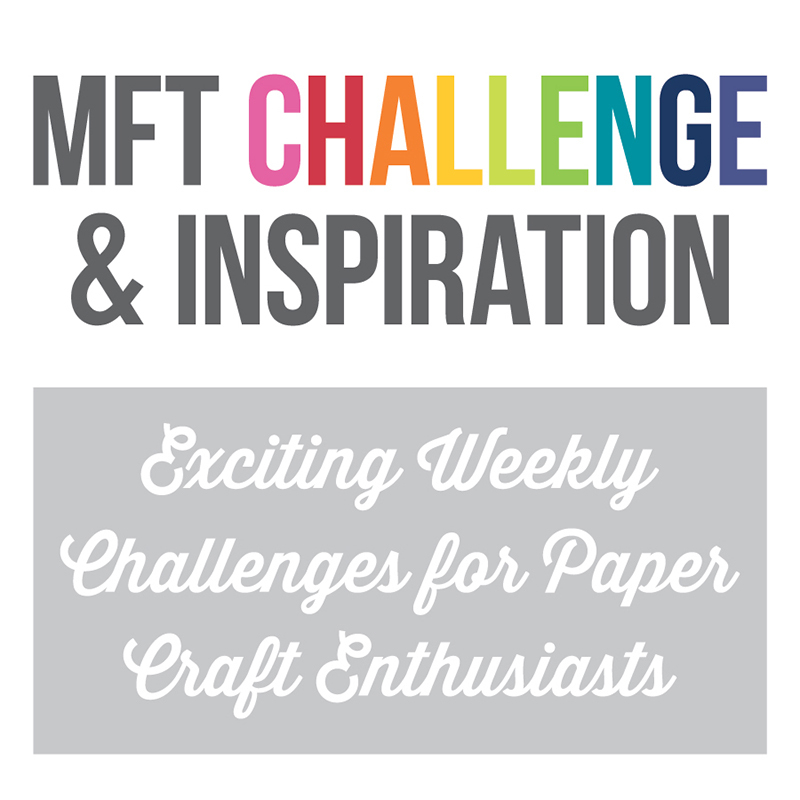 tutorial on the MFT Member Company Forum at SCS! Whew! Lots going on! Now on to my project for the hop! I'm using Feelin' Fruity? for my project tonight How cute is this set???!!!!!!??? The minute I laid eyes on it I thought: RETRO!!!! It took me back in time and I could see the fruit on my granny's curtains and aprons. 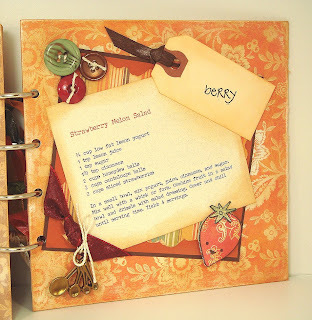 And, I immediately knew what I would do--a recipe album. I've been waiting for My Favorite Things to come out with a set that I could use for a recipe album. This was not what I expected but I'm thrilled with it!! I'm not going to go into a lot of detail since this post is going to be a long one already, and the pictures will probably tell the story well enough. Again, if you want any specific information, don't hesitate to email me. My overall "style" is sorta shabby, I guess, so I'm callin' it "Shabby Retro" ;-) Love that Typewriter font for a retro look. I do want to point out that this book is a little bit GREEN. I recycled the white sheets that come with SU! DSP for the covers and pages--just cut them into 6 x 6 squares and glued them together--3 for each of the covers and 2 for each page. I feel so virtuous, LOL! All of the fruit is paper pieced with a little bit of coloring with Copic markers. I've done lots of distressing, both with ink and a sanding block. Here's the front cover (the back cover is identical, without any embellishments). I used the Bling 'Bet set for my lettering. I hope you like this album as much as I do--I had a ton of fun putting it together and I'm thinking it will make a nice gift--if I can bear to part with it, that is!